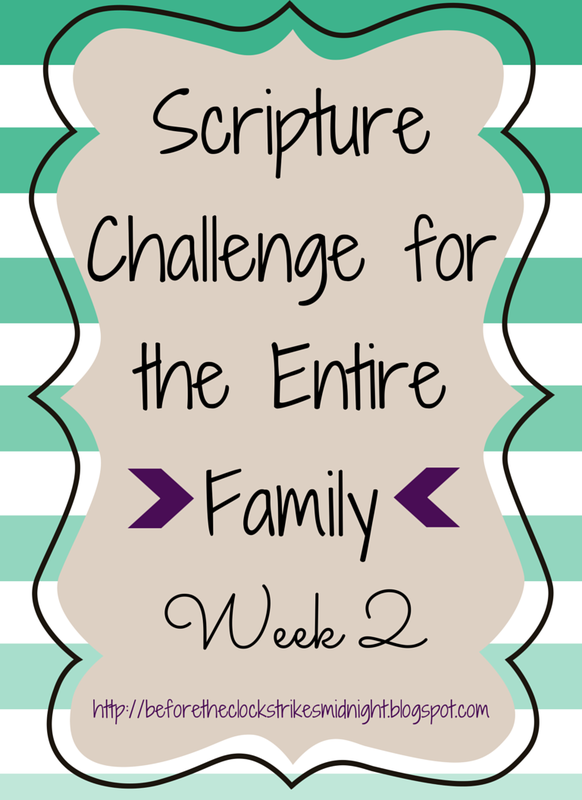 Welcome to week two of the Scripture Challenge! Have you ever found yourself at the point of someone's bullying/judging? Did your heart feel wrenched with anger, sadness, confusion and humiliation? Why do we judge others? Why is it so easy to assume the worst in people rather than the good? Recently, I was called out by someone who lives in the same area. The woman automatically assumed the worst about my entire family. I don't want to get into the specifics, but I couldn't believe someone could say and assume such rude things. I couldn't tell her what was going on because I was flabbergasted. The rude words were poison to my heart and mind. Today while I was eating my midnight snack the thought kept coming back,"forgive." Of course forgiving a bully will seem challenging, but through Christ we can do all things. Forgiveness gives everyone the chance to be cleansed of bitterness, anger, hate, sadness and many other emotions. As we forgive we grow closer to Christ and become stronger through love. 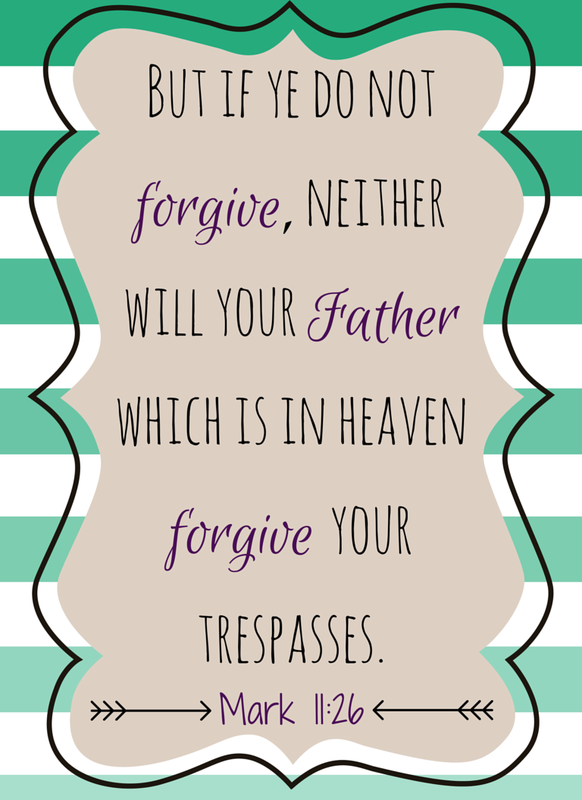 As you can probably tell the theme this week for the Scripture Memorization Challenge is "Forgiveness." Print out this scripture HERE . Have fun memorizing on your own or with your family! God bless! What a tough situation, Tiffany. I am sorry that you had to go through that. I never thought about it before, but it really is a weak person who cannot forgive. I struggle with forgiveness all the time, because I'm such a stubborn person! Thanks for a great reminder! Glad to hear I'm not the only stubborn person ;) Forgiveness really is a hard, but necessary skill to work on! Thanks for reading Charlee! A very good message and one that I think we all need to hear in the sometimes cruel world of social media. It's so funny that I was JUST doing my devotional this morning and this was the scripture I read, "But he said to me, “My grace is sufficient for you, for my power is made perfect in weakness.” Therefore I will boast all the more gladly about my weaknesses, so that Christ’s power may rest on me. 10 That is why, for Christ’s sake, I delight in weaknesses, in insults, in hardships, in persecutions, in difficulties. For when I am weak, then I am strong." Funny how God knows how to calm our troubles when He sends us to the exact scriptures we need, don't ya think? Great post! Thanks for sharing! I love that scripture :) He really makes everything possible. Have a great day! Thanks for being real. It encourages myself and others to be real about these heart issues. I am in the process of forgiving my teenage son. It is even harder when you love them so much. The things he says to me have the potential to poke holes right through my heart. But then I am reminded once again by reading posts like these, that I really need the forgiveness from the One Who I have pierced. Stopping by from Faith along the way to say hey and have a good day! So beautifully said! Thanks for sharing! Thanks for the sharing the great message. I am trying to forgive someone well it's not easy though. I am trying hard. I am your newest follower from Blog hop. Am following you via GFC and Facebook. Hi Tiffany! I just found your blog via Sweet Haute. I love that you are memorizing scripture as a family. What a wonderful habit and legacy to form. - So sorry about the bullying. Forgiveness IS hard and we can't do it in our own strength, but with God - through God - we can. Praying for you through this difficult time. Hi Ginger! Thanks for reading! I would be more than happy to join your linky party! Tiffany..."As we forgive we grow closer to Christ." Not only that but we become more like Him as well. I've had to take the same step as you but for a different situation and, yes, it was the best decision. For me. So glad forgiveness is your theme and that you shared it at Monday's Musings. Looking forward to having you share each week. Blessings. Thanks for stopping in to say hi! I'm glad to be apart of Monday's Musings!